Summary: One of the finishing touches used in some types of documents are an index or a special table, such as a table of authorities. Discover how to add these elements to your document with the least problem to get just the results you need. 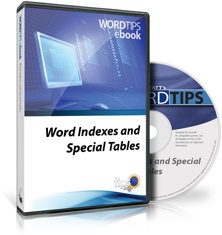 This is the complete table of contents for Word 2013 Indexes and Special Tables. for the price of two (you get two free). You can also order Word 2013 Indexes and Special Tables by calling our order line: 307-200-0450.